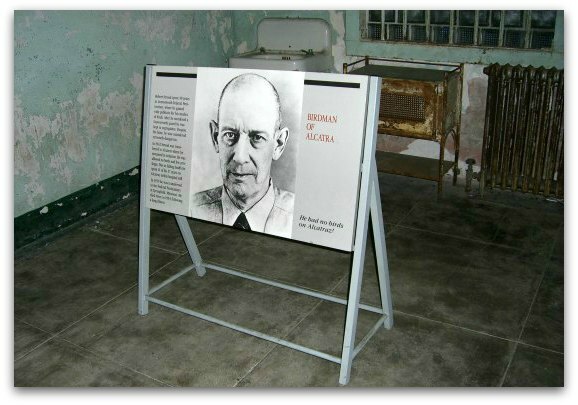 Discover the facts about Robert Stroud, the Birdman of Alcatraz, just one of the many infamous prisoners of Alcatraz. This is one of the few inmates that became famous after he was incarcerated. There is also some confusion about the details of the bird man of Alcatraz's life in prison. Read on to learn the truth about his life, why he was incarcerated, if he had birds in his cell at Alcatraz and other places he spent time in prison. where Stroud spent many weeks after he became ill.
Stroud was born in Seattle Washington in January 1890. He was the third of four children. Violence was part of his life from day one. Robert's father was against his birth from the very beginning. The hatred toward his third child was evident and this brought Robert and his mother closer together. His father's resentment toward Robert grew as his mother and he became closer. His father also began to abuse him at a young age. Anger filled Stroud and at thirteen he ran away from home. For three years, he begged for money and lived with other homeless people. He returned home at the age of 16. Less than two years later, he left again at the age of 18. He moved to Alaska where he fell in love with a prostitute, Kitty O'Brien. This is where his real life of crime began. O'Brien worked at a local bar with an ex-boyfriend, Charlie F. Dahmer. One night in 1909, when Robert Stroud was still only 18 years old, O'Brien spent the night with Dahmer. Reports state that Dahmer mistreated and even beat O'Brien. The next morning O'Brien told Stroud. Robert Stroud shot Dahmer once in the head, fatally wounding him. That same day, Stroud turned himself in. Robert Stroud started his term in prison at McNeil Island Federal Penitentiary in Washington State. He quickly became known as a troublesome inmate. While serving time at McNeil, he stabbed another inmate. The reason he gave for the stabbing was that the other prisoner snitched on him for taking food to his cell. Stroud's punishment was six months of solitary confinement. After this punishment was done, he was also scheduled to transfer to Leavenworth Penitentiary in Kansas. At the time, Leavenworth was known as one of the toughest prisons in the US. Robert Stroud's criminal career continued behind bars. At Leavenworth, he stabbed and killed a guard. There are conflicting stories on the reason behind this killing. His story is that he was harassed by the guard. Other prisoners that wrote books about their experiences in Leavenworth confirm this theory. However, Leavenworth has no documentation about bad blood between the guard and Stroud. Their official conclusion is that it was a random act of violence by Stroud due to his anger issues. Stroud was sentenced to death for the stabbing death of the guard. His mother tirelessly pleaded to get his sentence commuted to life in prison. Finally, President Wilson listened and Stroud's sentence was converted to life in prison. The warden at Leavenworth interpreted the life in prison sentence as a life in solitary confinement sentence. In Leavenworth, Stroud also began to take classes. He took mail order classes from a number of schools and had a passion for learning. While he was incarcerated at Leavenworth, Robert Stroud became interested in birds, specifically canaries. It all started one day in 1920 during his one hour a week walk in the yard. Stroud found a couple of injured birds and picked them up. He talked the guard into letting him take the birds to his solitary confinement cell and help them mend. He then received permission from the warden to keep the birds and help others when needed. His passion grew from there. He began to build cages to treat other birds. Since he was in solitary confinement and was only allowed out one hour a week, he spent 100% of his time with the birds. During this time, Stroud leaned a lot about birds. 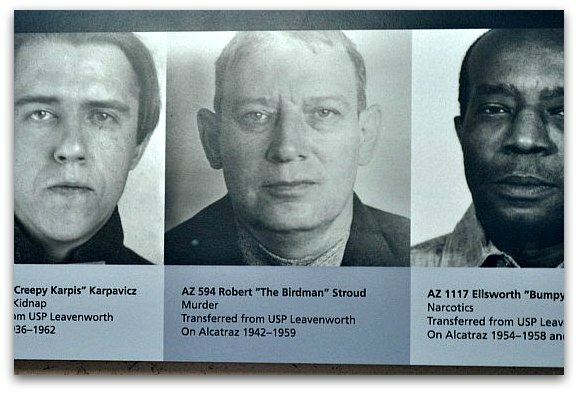 Stroud's official mugshot from Alcatraz - this is on a sign on the island alongside the other infamous prisoners that spent time here. He also began to write and study their diseases. Stroud turned his small bird hospital and research center into a profitable business. He even got permission from the warden to set up a second cell next to him to expand. The prison cut a walkway between the two cells, so he could go back and forth as much as needed. His business consisted of taking care of other people's sick birds. He also created treatments for the birds and started breeding them. His business allowed him to fully support his mother. Robert Stroud also published his first book while at Leavenworth. The book was called Diseases of Canaries. As you can imagine, the warden was not a fan of Stroud. In 1931, the warden had enough and worked to stop Stroud's bird business. After a lot of debate, the warden lost the battle and Stroud was granted permission to continue his studies. People outside the prison continued to support Stroud's efforts and even donated equipment to him. Finally, in 1942, Robert Stroud was transferred to Alcatraz Island without notice or explanation. The rules here were very different and a lot stricter. Stroud was prisoner number 594. At this prison, Stroud was not able to continue his hands on bird business or research. He never had any birds in his cell here. Stroud's fame was created after he went to prison. He's now known as one of the most famous prisoners to ever serve time here. By the time Stroud arrived here, he was already 52. He had spent most of his life in prison. Most of those years were in solitary confinement. In 1943, still a prisoner of Alcatraz, Stroud published his second book. The book was titled Stroud's Digest on the Diseases of Birds. - the area where Stroud spent much on his time in this prison. Even though Stroud was focusing a lot of his time on his research, he still couldn't stay out of trouble. In 1948, he supported the efforts of a group of prisoners that tried to escape from the island. He did this by donating money to their defense. In 1948, he also staged a hunger strike with the rest of the prisoners. Both of these incidents sent him back into solitary confinement at Alcatraz. This meant time in the basement of the prison alone without any sunlight. Robert Stroud spent a total of 17 years at Alcatraz. Due to his behavior there, six of those years were in solitary confinement. The years of isolation were really hard on him. He tried to take his life twice. His health was also deteriorating. In 1959, Robert Stroud was transferred out of Alcatraz. He moved to the Medial Center in Springfield, Missouri. He died quietly in his sleep in 1963 at the Medical Center. Stroud was 73. A few days later, he was buried in the Masonic Cemetery in Metropolis, Illinois. 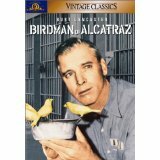 In 1962 while Stroud was still alive, a movie about his life called theBirdman of Alcatraz was released. It stared Burt Lancaster as Robert Stroud. Stroud was never able to see the movie, since prison rules prohibited it. The rules state that prisoners can't watch or read any stories that include violence or crime. Some of the controversy around Stroud's life and confusion around the real Robert Stroud are due to the movie. The movie portrayed him as a kind, gentle bird lover. It also showed scenes of him tending to his birds at Alcatraz. As I mentioned above, both of these are false. Due to the strict guidelines at Alcatraz, he was not allowed to have birds in his cell with him. I've also read several accounts and descriptions of Stroud from inmates that served with him. All of them confirm that he was a very violent man. Many also refer to him as a psycho path that deserved most of the treatment he received. Robert Stroud, the Birdman of Alcatraz, had an interesting and eventful life behind bars. The longer he spent behind bars, the more famous he became. He is one of the few that became famous for his crimes and activities that occurred after he was incarcerated. Many others were famous for the crimes that lead them to prison. Biography of Al Capone: Learn more about the life and down fall of the most infamous prisoner of Alcatraz, Al Capone. Here you can learn more about why he went to prison, how he ended up in Alcatraz and where he lived out his final days. Prisoners of Alcatraz: Discover what it was like to be a prisoner of Alcatraz. In addition, you can learn more about two of its other famous prisoners - Machine Gun Kelly and Henri (Henry) Young. Escapes from Alcatraz: How many prisoners tried to escape from Alcatraz? What are the most famous escape attempts? Uncover the answers to these questions and more. 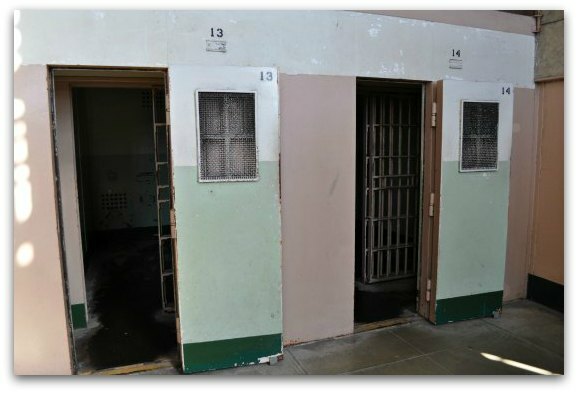 Alcatraz Prison Tours: How are the day and night tours different? Find out more about each one and use these helpful tips to determine which one is right for you. Visit Alcatraz: Do you already have your tickets? If so, it's time for a few tips for your trip from taking the ferry to making the most of your time on Alcatraz Island.